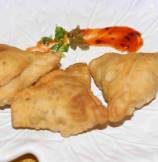 A famous authentic Indian snack, Samosas are prepared and liked in almost all parts of world these days. 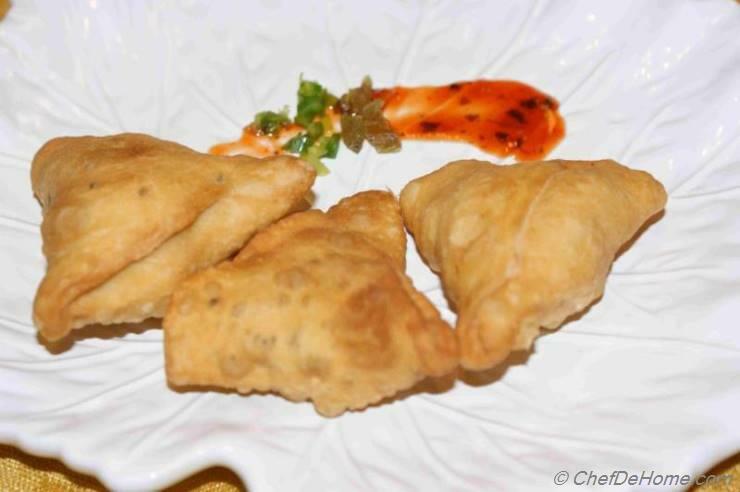 They're a lovely snack for a rainy cold day... We share with you step by step recipe to make delish Samosas at home. 1. Knead all dough ingredients and water to make dough. 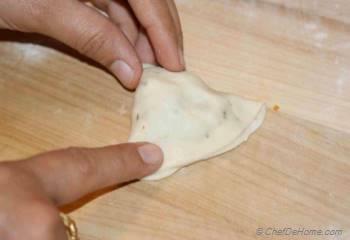 (Knead 5 minutes more then regular dough for extra smooth texture) . Set aside covered with damp cloth at room temprature. Add Peas in boling water and cook till slightly tender. If using Frozen Peas, you can directly add peas in stuffing. 2. Heat 1 tbsp oil in pan, fry Mustard seeds till start to cracker. Add cumin seeds, fry for 20 seconds. 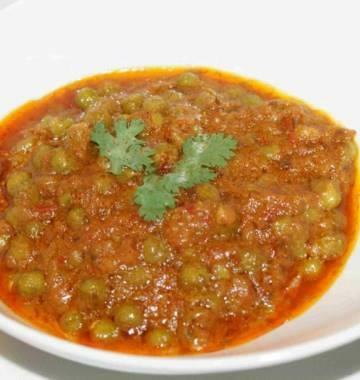 Add coarsely chopped potatoes, peas, salt, red Chili Pepper, Green Chili Pepper and fry for 1-2 minutes. 3. 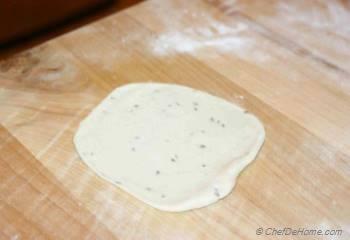 Make small round dough ball and press between hands to flatten it to a small disk. 4. Roll flattened disk to make a cone. 5. 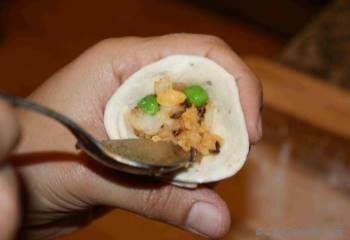 Fill 1-2 tbsp of potato and pea mixture in the center of each cone. 6. 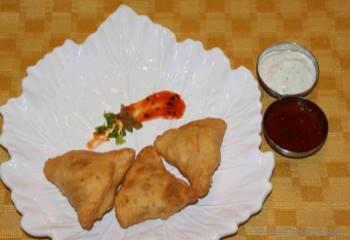 Close the open end of Samosa as shown in the image on left. 8. 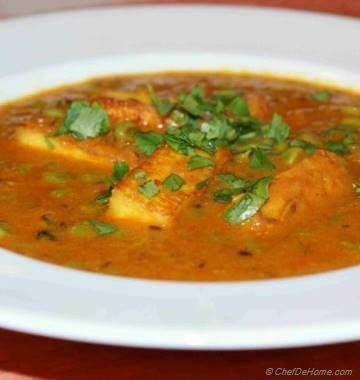 Serve hot with Tea and Chutney. Sure @Neel. Lamb Samosas will be as delicious as one with potato filling. Give it a try. Let me know if you need any help with lamb filling ingredients/recipe. Feel free to email us your recipe to share it with rest of food lovers. In Canada, we get these at every corner. 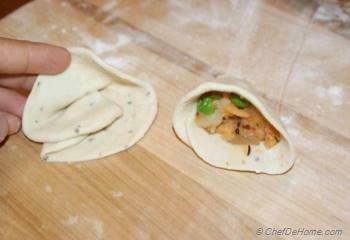 But this Samosas recipe looks so authentic and easy to make. I think I will try making these at home too. How about Chicken or lamb filling? Ooooo, I LOVE samosas!! I can't wait to try this! Wow!!! 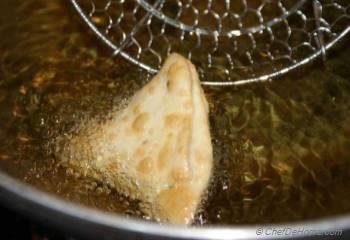 Samosa looks so delicious. 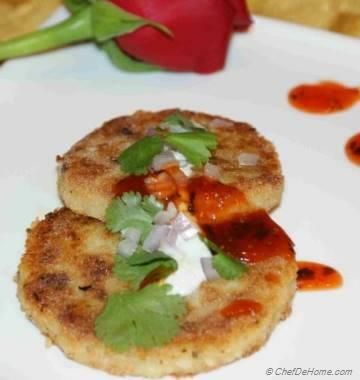 Whenever we visit Indian market, this is our favorite item to snack on. Thanks for sharing recipe. I always wanted to make it at home. it was so so easy, tried it first time at home. I love your site, all recipes are so easy to follow. My family liked Samosa very much.